Way up north in Seattle’s Pinehurst neighborhood, in a process that stretches back to 2006, Safeway has been working to get a rezone for the construction of an expanded store at NE 125th St. and 15th Ave. NE. 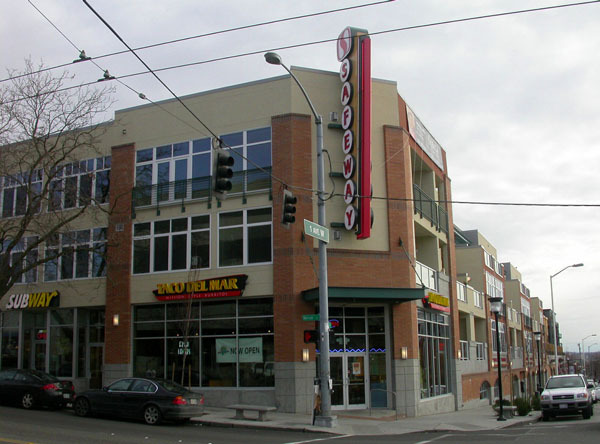 In December, the City Council passed an ordinance allowing Safeway to apply for the rezone, and today SLOG reported that the rezone appeal deadline has passed. As a carrot for the neighborhood, Safeway has committed to building WA State’s first “Green Safeway.” What does that mean? According to all that I’ve seen published, it means these three things: local construction materials, heat reclamation from refrigerators, and pervious pavement for the parking lot and adjacent sidewalks. Let’s take a closer look at these strategies. Use of local construction materials is a proven sustainable development practice. Let’s hope that Safeway commits to a quantifiable goal that is on par with established green building standards such as LEED. Grocery stores are notorious energy hogs, mainly because of all the refrigerators, so reclaiming their waste heat to provide space heating for the building is a smart strategy. Although perhaps not so much, when you consider that most of the refrigerators (and even freezers in some cases — hello Trader Joe’s) in modern grocery stores are open units without doors. If a grocer was serious about saving energy, the first step would be to use refrigerators that don’t wastefully blow all their cold air out into the store. So why no doors? Because apparently people buy more if there is no barrier whatsoever (i.e. even a glass door) between them and the food products. Believe it. To me the logic seems flawed, since you’d think that a person would eat the same amount regardless of whether or not they have to open a refrigerator door to buy it. But all the same, I’m sure the marketing research has been done and shows that open refrigerators move more product. So then, not only are they wasting energy, but they are compelling people to eat more than they need. But hey, that’s OK, they’ll reclaim the waste heat from the refrigerators to heat the building that’s being cooled by those same open refrigerators. Next. Pervious pavement allows stormwater to percolate directly back into the soil, which decreases the load on municipal stormwater systems, and also helps restore natural hydrology. But Seattle’s thick clay soils often preclude their use, and in March 2007 Dykeman Architects noted that a soil study would be required at the Pinehurst site. Large parking lots are the perfect application for pervious pavement. But let’s consider why there’s a need for such a large parking lot in the first place. In the case of modern grocery stores, it’s simply because the stores are so big. The proposed Pinehurst Safeway store is 50,000 square feet — a little more than one acre — for which Seattle’s code requires 100 parking stalls that would eat up about 35,000 additional square feet of space. Big stores need to have lots of people in them at any given time, and they have to put their cars somewhere. But furthermore, the bigger the store, the larger the geographical area from which it must draw customers. And since trips to the store are then longer on average, this means a higher fraction of trips by car, and in turn, the need for a larger parking lot. From the perspective of the urban system as a whole, grocery stores should be smaller and more finely dispersed. And what about that expansive building roof, which is also impervious surface? A green roof is the solution for mitigating runoff, but is likely not being considered due to perceptions about added cost. The proposed Pinehurst store is a single-story, single-use building. The project would be much greener overall if it put housing above the first floor. Safeway has done this with stores elsewhere in Seattle. And let’s not forget that the big grocery store chains are integral to our highly unsustainable corporate food system. Anyway, all that said, it’s a good thing that Safeway will be taking some green steps with the Pinehurst store. Change is incremental and all that. But let’s recognize that these steps are a lot like band aids for cancer. And let’s also recognize that it’s not fair to place all the responsibility for sustainability on the grocery store chains, or any other corporate retailer or producer, for that matter. They are all operating within, and responding to a system that is driven by us, the consumers. If we want a more sustainable world, then we need to take responsibility and not give our money to inherently unsustainable businesses (hint: stick with Madison Market or PCC). And no, I don’t always practice what I preach. Posted by dan bertolet on	Thursday, February 28th, 2008 at 1:13 am. You can follow any responses to this entry through the RSS 2.0 feed. You can leave a response, or trackback from your own site. Housing was discussed with Safeway early on. Unfortunately, the economics of housing in Pinehurst v. Queen Anne are very different. Contruction costs are the same in Pinehurst as they are in Queen Anne, but values are much higher in Queen Anne. Safeway came a long way in this project and listened to what neighbors wanted to see in a new store. Pinehurst recognizes their effort in this. Also, we view this project as a catalyst for more green development in our neighborhood. This project has rallied the Pinehurst neighborhood together. We started a new community group focused on working to make Pinehurst a more walkable, vibrant and sustainable neighbrohood. I think a good next step for Seattle (and all of WA?) would be to start restricting the sales experience. Retail gets away with high energy use in the name of sales. They’ll use every bit of energy allowed by code if it effects sales, since energy is dirt cheap compared to their core business. And we help them out with this – by allowing, for instance, triple the lighting power density compared with an office (people buy more of a well-lit product). By implementing good energy code language we level the playing field. If all grocery stores have to cover their refrigerated products, then any individual store that does this wouldn’t be penallized with a loss in sales. Oh, and even energy recovery uses more energy than not using that energy in the first place. Oops, I take that lighting part back. It’s triple the lighting power density plus all of the lighting power density of moveable displays (i.e. refrigerators in this case), which are exempt. Renee, sorry to be so critical. I’m glad that this project has helped organize your community, and I’m glad Safeway is trying some green strategies in Pinehurst. But when I think about all that we should be doing to combat global warming, and how quickly it needs to be done, and that furthermore, we have the technological knowhow now but we’re not taking advantage of opportunities to apply it, well, I can’t help getting a little turned off when I hear about a “green Safeway” that isn’t really very green in the big picture. Also, you are probably aware of this, but Safeway put housing over a store in the Central District, which, like Pinehurst, is not as expensive as Queen Ann. Though the CD store has 5 stories of housing, so perhaps it wouldn’t have penciled with Pinehurst’s lower height limit. Dan S, the business model for smaller stores is we pay more for groceries because we aren’t externalizing the cost to the environment or communities. I’m not so sure the future will favor carpooling to the big box over walking to the corner store. There’s more involved in that decision than the price of gas, and people are starting to recognize that.